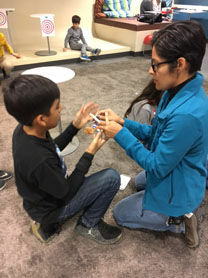 CJ Mendez receives a helping hand from his mother to craft his catapult during a STEM program last week at the McAllen Public Library’s main branch. Teens and tweens gathered on the plush carpet of the McAllen Public Library last week with three simple materials — popsicle sticks, bottle caps and rubber bands. The end result was a catapult that could launch foil cannons meters to reach the bull’s-eye targets set upon a stage. The building event was part of the library’s MakerSpace program designed to bring 6th through 12th graders together to develop their critical thinking skills. For 11-year-old CJ Mendez, who is homeschooled, this was his first time to attend an event at the library. Mendez said he also enjoys building things at home and could see himself choosing a career in the field of Science, Technology, Engineering and Mathematics, or STEM. Along with the instructor, teen volunteers were on hand for the event. Trinity Altemeyer of IDEA Quest High School and Simon Mezquita of Achieve Early College High School are part of the Teen Advisory Committee at the library and assisted by rolling foil balls to launch and themselves created an abstract prize made of foil and popsicle sticks. The library has stepped up its game by offering a youth program every day, especially during the winter break, according to Zuniga. Many of the youth were accompanied by a parent who overlooked or provided a guiding hand. Alicia Collins was present with her two daughters, ages 11 and 12. They are part of a large homeschool community that takes advantage of the library’s programs. Her girls have participated in previous STEM related programs offered by the library, including a coding activity and have even attended STEM camps offered by the University of Texas Rio Grande Valley. MakerSpace is a program the library hopes to continue every month, depending on resources and supplies. A complete list of events and programs can be found on the website, mcallenlibrary.net.